Alarm and event logging can provide valuable information to help determine the cause of abnormal plant conditions and reduce plant downtime. Now, local low-cost alarm logging is available for all Omniflex alarm annunciators, providing historical data for post-critical alarm monitoring and reporting. The compact DIN rail mounting logger interfaces with the annunciators via the Modbus RS 232/485 Serial Port and stores the date and time of alarm events and operator pushbutton controls to a standard microSD memory card. The SD memory Card can then be used to simply transfer the data via .csv file to an Excel spreadsheet, using the Omnilog template file provided with the logger. This convenient and low-cost way of alarm logging can be supplied with all new alarm systems and can also be added to existing installations. • Integral real-time clock with battery backup. 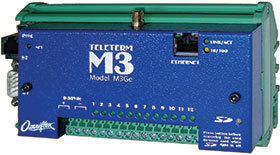 • Modbus RS 232/485 port.